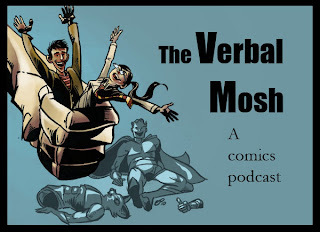 It's a new episode of The Verbal Mosh. New York Comic Con is next week. We are so jazzed This week, we review: Action Comics #2 (with Harry Kent or Clark Potter... who called it? We did, that's who! ), Animal Man #2, Chew #21, Invincible #83, Moon Knight #6, Swamp Thing #2, and Sweet Tooth #26. For more info, reviews, our social media links, yadda yadda, etc., etc. Write us an iTunes review. Thank you to everyone who has done so so far. We truly appreciate it.